The presentations and publications below are used as training material on Forest Watch topics. The following Excel spreadsheet programs can be downloaded and used on your computers for entering Forest Watch data. The programs automatically conduct data calculations and place all important data on a master datasheet. Enter your data and save the file with the name of your school and year (i.e. northwestern_98.xls). 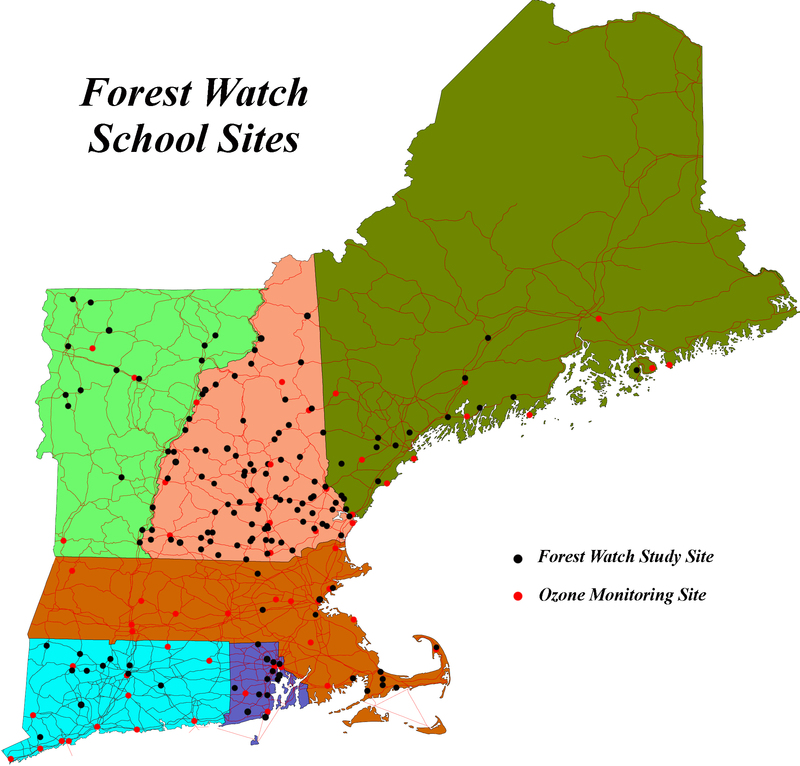 Either email the saved file to us (forestwatch@unh.edu) or print-out hard copies and mail them to us. Download the instructions below for more information. Note: Excel file also has instructions in it. MultiSpec Materials The tutorial Exploring a Satellite Image (download below) provides an introduciton to useing the MultiSpec freeware program for processing, manipulating and analyzing satellite iamgery. THe turotial walks the user through various basic functions including downloading the software, opening images, panning, zooming, etc., to more advanced techniques such as band manipulations, i.e. making false color images and exploring the spectral signatures of various land cover features. This tutorial provides a robust introduction to satellite image processing, which can be completed from start to finish in approximately 2 hours. In order to use the MultiSpec tutorial, you will need the MultiSpec software. You will also need the subset Landsat image of Beverly, MA, which is used in the tutorial. The image can be obtained directly from the link below. There are a variety of other useful materials about image processing with MultiSpec at the UNH Globe website, including change over time and landcover classification tutorials. A 2001 report of the New England Regional Assessment (NERA) group, one of 16 regional assessments submitted as part of a national look at potential climate change impacts. Supporting material for the assessments in the overview document.